Seemingly simple decisions about a screening test can have unexpected consequences. Understanding the balance of such consequences, including benefits and harms, can be confusing for patients and clinicians, but it is central to informed decision making. Clinicians must effectively communicate the likelihood that a patient might benefit because an undetected condition is found and effectively treated, as well as possible harms from false-positive findings or from overdiagnosis, which occurs when conditions that would never have affected a patient are diagnosed. Such numerical details are difficult to remember. Notably, explaining the likelihood of benefits and harms is only the first step in the shared decision-making process. This process must also identify and integrate a patient’s perceptions, values, and preferences about screening consequences in order to make a decision. Knowledge translation (KT) tools can simplify complex discussions between clinicians and patients, and improve patients’ knowledge of options, as well as the accuracy of their risk perception, among other benefits. An increasing variety of tools are available to support shared decision making. In this article, we present a case that illustrates the value of KT tools in shared decision making. In the presented case, a clinician perceives a conflict between patient preferences and the preventive health guideline recommendation. Along the way, we will introduce a variety of KT tools produced by the CTFPHC to support preventive health decision making, describe why KT tools are helpful, and explain what makes a KT tool useful. “I need to know my prostate cancer number,” says Kip as he walks into your office. Kip is a 55-year-old man with no relevant family history of prostate cancer. He has heard from a friend, a survivor of prostate cancer, that all men older than age 40 should have the prostate-specific antigen (PSA) test. Kip has visited numerous prostate cancer–related websites and watched online videos about PSA screening shared by his friends. For men like Kip, who are between the ages of 55 and 69, with no relevant family history of prostate cancer, the CTFPHC provides a weak recommendation against screening for prostate cancer with the PSA test based on moderate-quality evidence. Various tools developed by the CTFPHC can help Kip to make a decision that is right for him. Knowledge translation tools can be broadly organized into 3 areas: implementation tools (eg, point-of-care tools), resource planning tools (eg, equipment or technology needed to support implementation), and evaluation tools (eg, quality indicators).3 Most CTFPHC KT tools are implementation tools. The most common types of implementation tools are printed educational materials and decision aids, which can have a range of uses, target audiences, delivery channels, formats, and components (Table 1).4 Printed educational materials typically refer to printed guidelines, recommendations for clinical care, and peer-reviewed publications,5 but can also include frequently asked questions and other formats. Although traditionally delivered on paper, printed educational materials are increasingly available via electronic applications. They are typically considered passive implementation tools. Decision aids, on the other hand, translate evidence into user-friendly formats in order to actively inform conversations with patients about their decision options, help clarify their values related to possible benefits and harms of options, and guide them through the decision-making process.6 However, Gagliardi and colleagues’ classification of KT tools does not separate passive dissemination and active implementation tools.3 Thus, the term implementation tool as used here, and shown in Table 1,4 refers to a tool (or its components) that can be used for either a passive or an active implementation process. For example, Figure 14 shows an infographic on screening, a popular component of decision aids, which provides visual representation of information that can actively guide a decision-making process or be distributed passively, such as through mass mailings to clinicians or patients. As the CTFPHC 1000-person diagram shows (Figure 1),4 for men like Kip the risk of dying from prostate cancer is 5 per 1000 men screened compared with 6 per 1000 men not screened. While considering Kip’s request for PSA testing, you recall that the CTFPHC website has KT tools that can help facilitate shared decision making. You refer Kip to the short video by Canadian physician Mike Evans on PSA testing,7 provide him with the CTFPHC tool entitled PSA Screening: Patient FAQ,8 and book a follow-up appointment to discuss further. Figure 14 shows that screening 1000 men for prostate cancer with the PSA test would save 1 life over 13 years. The overall reduction in prostate cancer mortality is 1 per 1000; although not shown in the infographic, there is no reduction in all-cause mortality.12 The infographic also shows possible harms from screening. It shows that among 1000 men screened, 178 men with positive PSA test results will have follow-up testing that does not identify prostate cancer (false-positive findings) and 4 of those 178 men will experience biopsy complications. Furthermore, the infographic shows that 33 per 1000 men screened will be diagnosed with prostate cancer that would not have caused illness or death (overdiagnosis) and will be potentially exposed to treatments and their adverse effects, as well as experience anxiety from knowing this overdiagnosis of prostate cancer. What is a useful KT tool? IPDAS—International Patient Decision Aids Standards. How does the CTFPHC develop KT tools? The CTFPHC develops plain-language tools that are intended to guide active conversations or to be reviewed by individual clinicians or patients (passive implementation). Based on desired and trustworthy features of KT tools, the CTFPHC makes use of synthesized evidence from CTFPHC guidelines and other systematically collected evidence from patient-engagement activities. Following a series of development and review stages, a KT tool undergoes usability testing with target end users. Target end users provide feedback on the tool’s content, format, and navigation; aesthetics; and the perceived usefulness of the tool, which is expressed either during one-on-one interviews or focus groups. Feedback from target end users and CTFPHC partners is incorporated into final versions of KT tools. Kip is back in your office, and you check if he understands his decision options, which include getting a PSA test or not getting a PSA test. To guide your conversation, you use the CTFPHC 1000-person diagram (Figure 1)4 for men aged 55 to 69 years of age. You help Kip understand the risks of benefits and harms of PSA testing using natural frequencies, which are more understandable than probabilities (eg, 1 less man per 1000 screened over 13 years will die from prostate cancer compared with men who are not screened). While reviewing portions of the tool with Kip, you seek to understand how much the potential benefits and harms matter to him. He is not impressed with the modestly reduced risk of dying from prostate cancer as a result of PSA screening. He is not that concerned about a prostate biopsy if his PSA is elevated; he has been through worse. On the other hand, Kip is concerned about getting a prostate cancer diagnosis if that cancer was not destined to become a problem in his lifetime. You then review whether Kip has enough information to make a decision. Kip is confident he has enough information to choose. He decides not to have the PSA test. Kip thanks you and takes a hard copy of the CTFPHC 1000-person diagram to show to friends. Knowledge translation tools simplify our discussions with patients. They improve preventive health screening conversations by giving patients access to useful resources and helping them to understand relevant information. Knowledge translation tools provide direct benefits to both patients and clinicians in a shared decision-making context. Knowledge translation (KT) tools are resources and products that are meant to facilitate shared decision making between patients and clinicians (eg, decision aids). Tools can be clinician centred (eg, clinical practice guidelines) or more patient oriented (eg, plain-language videos). Not all KT tools are equally effective or equally trustworthy sources of health information. Ideal tool characteristics include an explicit statement of objectives, a description of the target audience, and instructions on tool use. Trustworthy KT tools should present a balance of harms and benefits, provide references for the evidence presented, and disclose conflicts of interest. Decision aids are designed to improve patients’ knowledge of their options, increase their participation in decision making, and increase their ability to accurately compare potential benefits and harms of options. They do not advise people to choose one option over another and do not replace counseling from a clinician. Use of a typical decision aid adds approximately 2.6 minutes to the clinical encounter. La traduction en français de cet article se trouve à www.cfp.ca dans la table des matières du numéro de novembre 2017 à la page e466. All authors have completed the International Committee of Medical Journal Editors’ Unified Competing Interest form (available on request from the corresponding author) and declare that they have no competing interests. For additional information on the conflict of interests of the Canadian Task Force on Preventive Health Care, please visit https://canadiantaskforce.ca/. 1. Straus S, Tetroe J, Graham I, editors. Knowledge translation in health care. Moving from evidence to practice. 2nd ed. West Sussex, UK: John Wiley & Sons; 2013. 2. Grimshaw JM, Eccles MP, Lavis JN, Hill SJ, Squires JE. Knowledge translation of research findings. Implementation Sci 2012;7:50.
. Knowledge translation tools are emerging to move neck pain research into practice. Open Orthop J 2013;7:582-93. What is GRADE? BMJ Clin Evid 2012 Sep 20. Available from: http://clinicalevidence.bmj.com/x/set/static/ebm/learn/665072.html. Accessed 2017 Sep 11.
. A framework of the desirable features of guideline implementation tools (GItools): Delphi survey and assessment of GItools. Implement Sci 2014;9:98.
. Prostate cancer—1000-person tool. Calgary, AB: Canadian Task Force on Preventive Health Care; 2016. 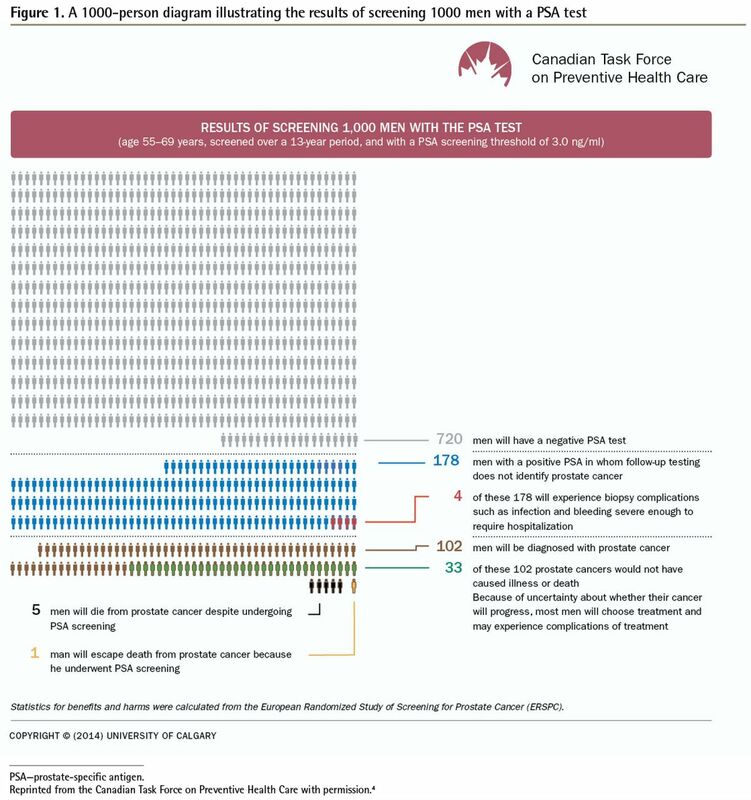 Available from: https://canadiantaskforce.ca/tools-resources/prostate-cancer-harms-and-benefits/. Accessed 2017 Sep 14.
. Printed educational materials: effects on professional practice and healthcare outcomes. Cochrane Database Syst Rev 2012;(10):CD004398.
. Decision aids for people facing health treatment or screening decisions. Cochrane Database Syst Rev 2011;(10):CD001431.
. The prostate specific antigen (PSA) test [video]. YouTube; 2014. Available from: https://www.youtube.com/watch?v=bTgS0DuhaUU. Accessed 2017 Sep 14.
. PSA screening: patient FAQ. Calgary, AB: Canadian Task Force on Preventive Health Care; 2014. Available from: https://canadiantaskforce.ca/wp-content/uploads/2016/05/2014-prostate-cancer-patient-faq-colour-en.pdf. Accessed 2017 Sep 14.
. Prostate cancer—clinician summary. Calgary, AB: Canadian Task Force on Preventive Health Care; 2016. Available from: https://canadiantaskforce.ca/prostate-cancer-clinician-summary/. Accessed 2017 Sep 14.
. Prostate cancer—video for physicians [video]. Calgary, AB: Canadian Task Force on Preventive Health Care; 2014. Available from: https://canadiantaskforce.ca/tools-resources/videos/. Accessed 2017 Sep 14.
. PSA screening: primary care practitioner FAQ. Calgary, AB: Canadian Task Force on Preventive Health Care; 2014. Available from: https://canadiantaskforce.ca/wp-content/uploads/2016/05/2014-prostate-cancer-clinician-faq-colour-en.pdf. Accessed 2017 Sep 14.
. Recommendations on screening for prostate cancer with the prostate-specific antigen test. CMAJ 2014;186(16):1225-34. Epub 2014 Oct 27.
. Knowledge translation of research findings. Implement Sci 2012;7:50.
. Assessing the effectiveness of decision aids for decision making in prostate cancer testing: a systematic review. Psychooncology 2015;24(10):1303-15.
. Adherence of pharmaceutical advertisements in medical journals to FDA guidelines and content for safe prescribing. PLoS One 2011;6(8):e23336. Epub 2011 Aug 17.
. Establishing the effectiveness of patient decision aids: key constructs and measurement instruments. BMC Med Inform Decis Mak 2013;13(Suppl 2):S12. Epub 2013 Nov 29. IPDAS 2005: criteria for judging the quality of patient decision aids. Hanover, NH: International Patient Decision Aids Standards Collaboration; 2006. Available from: http://ipdas.ohri.ca/IPDAS_checklist.pdf. Accessed 2017 Sep 12. Ottawa Hospital Research Institute [website]. Patient decision aids. Ottawa, ON: Ottawa Hospital Research Institute; 2017. Available from: https://decisionaid.ohri.ca/index.html. Accessed 2017 Sep 12.